Catharine (Kittie) Dardis (1819-1892) was the last of nine children born to James Dardis and Lucy Sims. Her father emigrated from Ireland to Tennessee before 1796. In 1800 the family moved to Knox Co., where Mr. Dardis obtained a license to trade with the Cherokees. He built a brick house at the junction of Main and Cumberland streets in Knoxville near Dardis Spring. Mr. Dardis was a lawyer who served as Justice of the Peace and Alderman. By 1830 the family had moved to Winchester, Franklin Co., where her father and his son-in-law James Robinson opened a dry goods store on the square. Catharine never married. After her parents died, she lived with various siblings. She died in 1892 in Franklin County. Kittie’s sampler shares a verse that also appears on a fragment of a sampler from the Lynchburg group, probably made in Knox County. 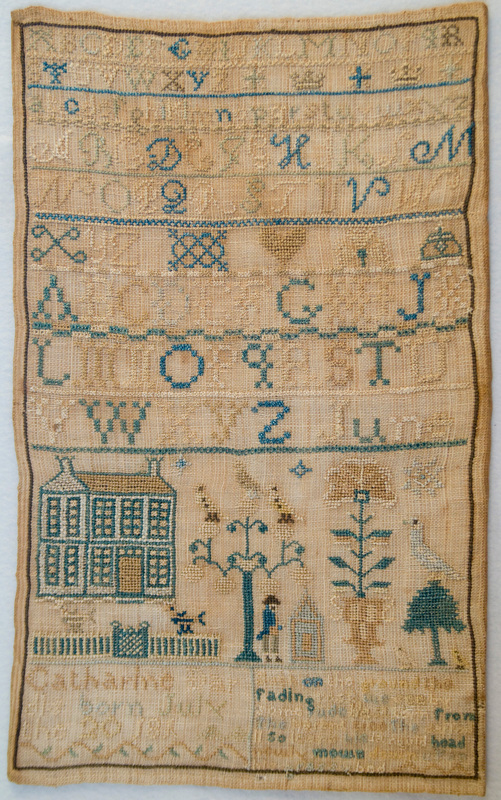 A similar sampler made by Mary W. Williams (TSS 180) was known to have been stitched at the Knoxville Female Academy. 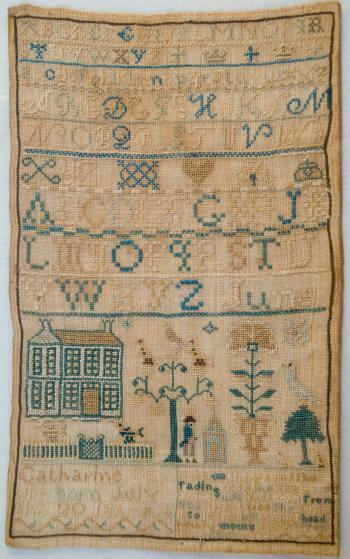 Her sampler includes the figure of a man, an unusual motif in TN samplers.